The Social Security Disability Insurance (SSDI) program is set to be the next big battle in Republicans’ long campaign to dismantle Social Security. Congressional Republicans are trying to block a routine reallocation of funds to the SSDI Trust Fund, insisting that they will only allow reallocation if “reforms” to SSDI are implemented. The intellectual underpinning for their demands is that there is an unfolding fiscal crisis caused by workers who are able to earn a living but are instead choosing to claim disability benefits. A chief proponent of this view, Stanford economist Mark Duggan, testified before the Senate Budget Committee earlier this year, claiming that disability benefits are increasingly attractive to lower-wage workers, who respond by leaving the labor force. According to Duggan, a key piece of evidence supporting this claim is an increase in the share of beneficiaries suffering from musculoskeletal disorders and other “subjective” health conditions who have a “substantial” employment potential. Claims like these have become a mainstay of attacks on the disability program. However, a closer look at the evidence shows that SSDI benefits have become, if anything, less generous. Moreover, even research cited by critics shows SSDI receipt has a negligible impact on work effort because few applicants, including marginal applicants who were denied benefits, are able to earn a living afterward. Meanwhile, there are good explanations for the increase in the share of beneficiaries suffering from musculoskeletal disorders, including an aging population, rising obesity rates, and fewer workers able to retire early when their health deteriorates. These topics will be discussed in later blog posts. 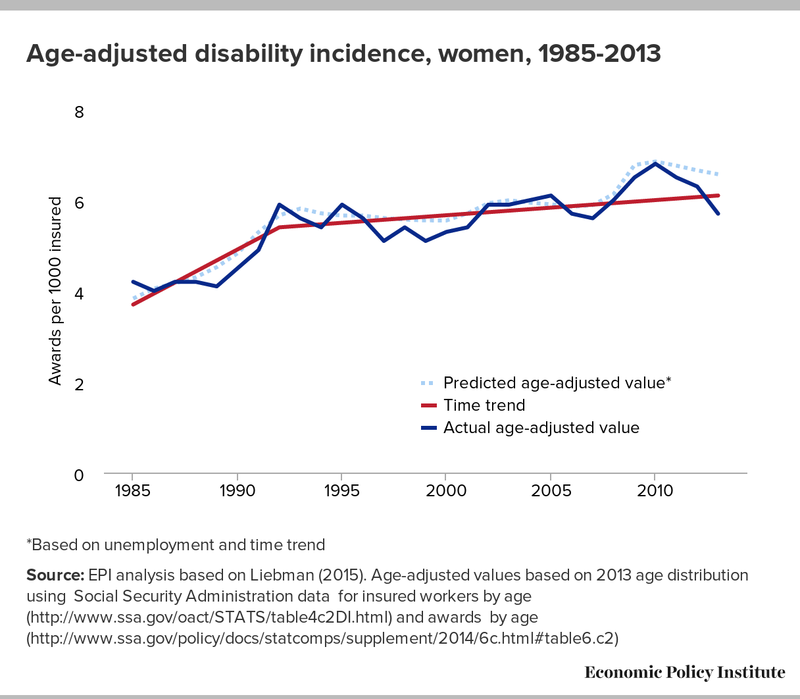 This post will focus on whether disability incidence has increased in the first place. The evidence shows that while “raw” or unadjusted incidence–the number of new awards per thousand insured persons–increased as the large baby boomer cohort aged into the peak disability years before retirement, age-adjusted incidence hasn’t trended upward over the past 20 years, though it increased during periods of high unemployment. However, incidence has fallen in the wake of the Great Recession and as older baby boomers become eligible for Social Security retirement benefits, including disabled boomers who automatically transition to retirement benefits as they reach the normal retirement age. It’s natural to assume that where there’s smoke there must be fire. But when it comes to Republicans claiming that “financial incentives” are fueling a rise in disability, we should look for smoke and mirrors. As researchers at the Center on Budget and Policy Priorities have laid out in detail, Duggan and other critics have made much of a growth in enrollment that is mostly due to demographic and other identifiable factors that have nothing to do with people gaming the system. These include population growth, an increase in women’s labor force participation, an increase in Social Security’s normal retirement age from 65 to 66, the aging of the large Baby Boomer generation, and an increase in life expectancy at older ages. Only the last two–which resulted in an older insured population and longer benefit receipt–pose a challenge, while other trends have benign or even beneficial implications for Social Security’s finances. The increase in women’s labor force participation, for example, increased the share of beneficiaries who paid into the system as opposed to being eligible based on spousal contributions. Is Social Security on an unsustainable course? The Social Security actuaries project that costs will decline and then level off below 0.8 percent of GDP as the Baby Boomers age out. Underlying this projection is an assumption that age-adjusted incidence isn’t increasing, an assumption Duggan challenged when he served on the 2011 technical panel of the Social Security Advisory Board (SSAB). Recently, however, Harvard economist Jeffrey Liebman presented evidence to the current SSAB technical panel showing that there had been no upward trend in age-adjusted incidence over the past 20 years after demographic and cyclical effects are taken into account. Rather, Liebman found a modest decrease in men’s incidence and a modest “catch-up” increase in women’s incidence that offset each other. A later version published in the Journal of Economic Perspectives (and edited by Duggan, according to an April 21 Politico Pro article available only to subscribers) termed men’s adjusted incidence “steady” rather than declining based on an analysis of data through 2007, though Liebman’s charts show a decline in age- and unemployment-adjusted incidence between 2007 and 2010. Extending the analysis to 2013 (see Figures 1 and 2) confirms that men’s adjusted incidence has trended downward even as unadjusted incidence increased in the Great Recession and weak recovery. How do Liebman and Duggan come to such different conclusions? The main reason is that Duggan puts more weight on older data, and his Senate testimony shows he is sticking to his story even as disability incidence has plummeted in the wake of the Great Recession and as the Baby Boomers begin aging out. Essentially, Duggan extrapolates from a period in the 1980s when enrollment was rebounding from earlier cuts, whereas Liebman emphasizes that there has been no upward trend in age-adjusted incidence since the early 1990s. Also, when Duggan claims that the percentage of adults receiving SSDI has risen even within age groups, he not only picks an earlier start date but focuses on the share of adults receiving benefits rather than the share of insured adults. Fewer women were insured–and paying into the program–when fewer worked outside the home. In the program’s early decades, policy shifts and reversals caused big swings in disability incidence and program costs. Initially limited to workers age 50 and older with permanent disabilities, by 1965 eligibility for disabled-worker benefits had been extended to younger workers with serious impairments of long, but not necessarily permanent, duration. In the stagflation years of the 1970s, disability incidence rose along with the relative value of benefits as wages, but not benefits, declined in real terms. Incidence peaked at seven new awards per 1000 insured participants in 1975 before cost-containment measures were initiated in 1977 and 1980. These included lower cost-of-living adjustments, tighter medical standards, and more frequent continuing disability reviews (CDRs), but without sufficient funding to pay for increased administrative caseloads. In the early 1980s, many beneficiaries were kicked off the rolls after seemingly cursory reviews and despite no improvement in their health. 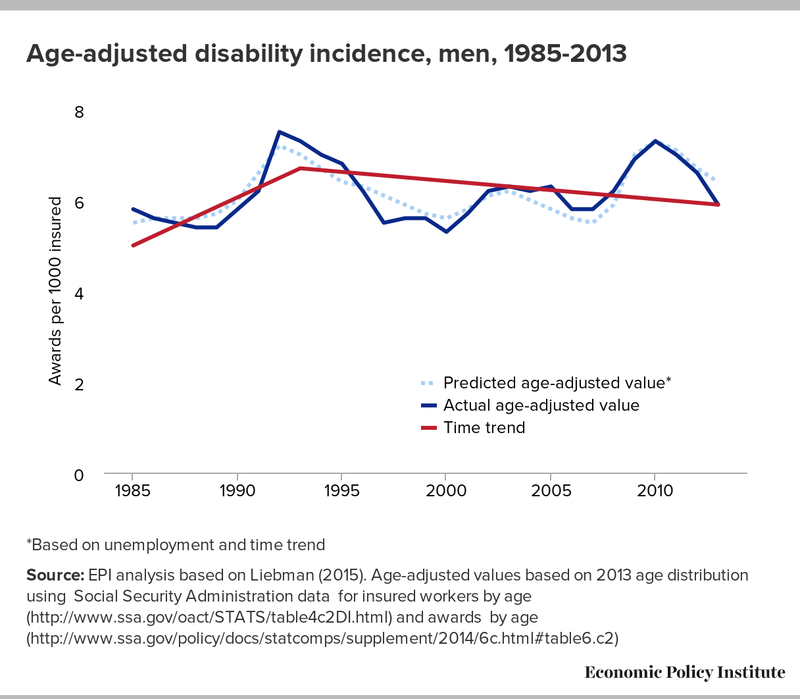 This sparked a political backlash that resulted in many former beneficiaries being reinstated and a ten-year (1983-1992) upward trend in disability incidence by age group. Raw incidence nevertheless declined during the early part of this period as the large baby boomer cohort entered the workforce, bringing down the average age of the insured population. But it then increased again as the baby boomers aged into their peak disability years, eventually regaining the 1975 peak in 2010 before declining in 2011-13. Incidence isn’t the only measure of whether the program is growing unsustainably. Others include the share of the insured or overall population receiving benefits (“prevalence”), and the cost of the program as a share of GDP. Critics also point to increases in the number of beneficiaries, though this is mostly driven by population growth and is not a very useful measure. Of these measures, age-adjusted incidence is the best indicator of whether financial incentives are causing more workers to apply for and receive benefits, since it is unaffected by changes in the age distribution of the population, changes in the share of the population insured for benefits, or changes in the value of benefits. Unlike prevalence, however, incidence doesn’t take into account mortality improvements that also affect sustainability. Age-adjusted incidence is affected by cyclical fluctuations in unemployment, though not as much as Duggan and other critics claim. The fact that incidence rises somewhat during periods of high unemployment is normal, since the inability to engage in “substantial gainful activity” (currently defined as earning $1,090 or more per month in most cases) is a key eligibility requirement. Mechanically, the share of workers in poor health who are no longer gainfully employed increases in recessions, growing the pool of potential applicants even though denial rates also increase in recessions. Though they complement antipoverty and health programs like SSI and Medicare, disability programs around the world are designed to insure workers against lost earnings and therefore take into account applicants’ ability to earn a living as well as their health. Duggan and other critics say the disability screening process in the United States hinges too much on applicants’ employment prospects, but it would be both wasteful and cruel to ignore workers’ marketable skills. Though Senator Rand Paul may think he can tell at a glance who should qualify for benefits (someone with “quadriplegia or paraplegia” and not someone who is “anxious or their back hurts“), there are people using wheelchairs who can support themselves and people with musculoskeletal or anxiety disorders who have no hope of ever doing so. The difference lies not just with the severity of an individual’s medical condition (a run-of-the-mill backache or panic attack doesn’t cut it), but also the market for his or her skills. If anything, the program’s earnings test is too strict, because earning potential is defined at the national level and doesn’t take into account labor market conditions. Workers can be denied benefits even if there are no jobs available for people with their qualifications and physical limitations anywhere in the country. The fact that earning potential is taken into account doesn’t mean workers with mild ailments are using the program “as a form of long-term unemployment insurance,” as Duggan suggests. Duggan has a habit of exaggerating cyclical effects by focusing on applications, rather than awards, never acknowledging that denial rates also rise during recessions. He also claims that “the SSDI program has become much more sensitive to economic conditions since the early 1980s,” which is a misleading way of saying that policy shifts in the earlier period (notably the early 1980s crackdown that coincided with a double-dip recession) swamped other effects. In fact, awards have become less sensitive to economic conditions in recent years, and careful research taking advantage of differences across states found that disability benefits are not being used as a substitute for unemployment benefits. Next: Are Disability Benefits Becoming More Generous?